Corning Epic Plate Reader Label-Free Detection Assay Cell Profiling Pharmacology . New Life Scientific, Inc. This Corning Epic system and featured CyBio liquid handler are in excellent cosmetic condition with minor signs of age. New Life Scientific acquired this instrument and the technicians performed a physical evaluation. The technicians did not notice any damage to the instrument's body, but the crown (topper) was heavily damaged; the largely plastic aesthetic piece was packaged separately, to meet height limitations, and may have been struck by a forklift. There are minor scuffs to the frame paint, but all observations suggest that the internal components were not compromised. New Life Scientific contacted the Corning field applications engineer that exclusively worked with this instrument and decommissioned it prior to sale; the plate carousel has been zip-tied for reduced movement in shipping and relocation. The Epic Gen 1 requires a new PC and operating system (Windows 7) which costs 10,000 USD; to re-certify (PM/validation) the Epic Gen-1, the standard annual service fee is 9500 USD. This cost estimate was provided by the technician and is only valid if all original parts are operable. For more information about this instrument, please contact New Life Scientific. 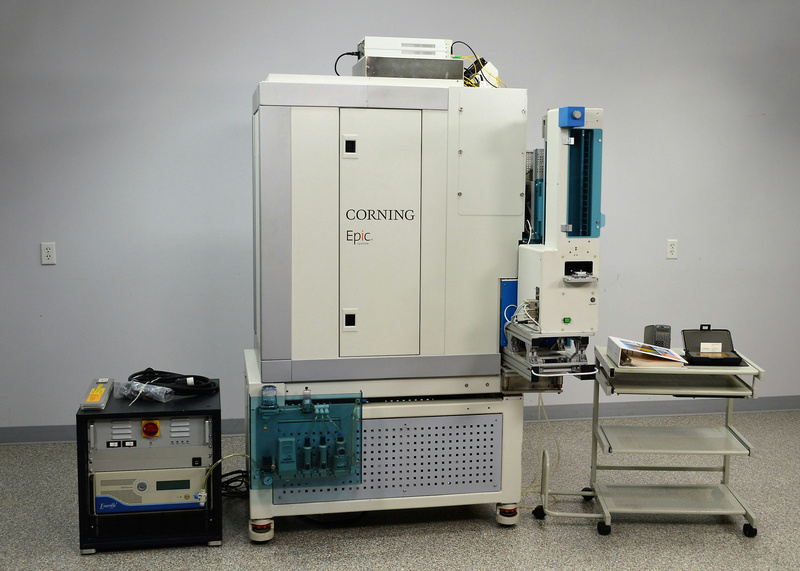 Please refer to this video of the Corning Epic system New Life Scientific technicians.